Hello, dear readers – it’s been awhile! But I’m back, and I intend to stay. 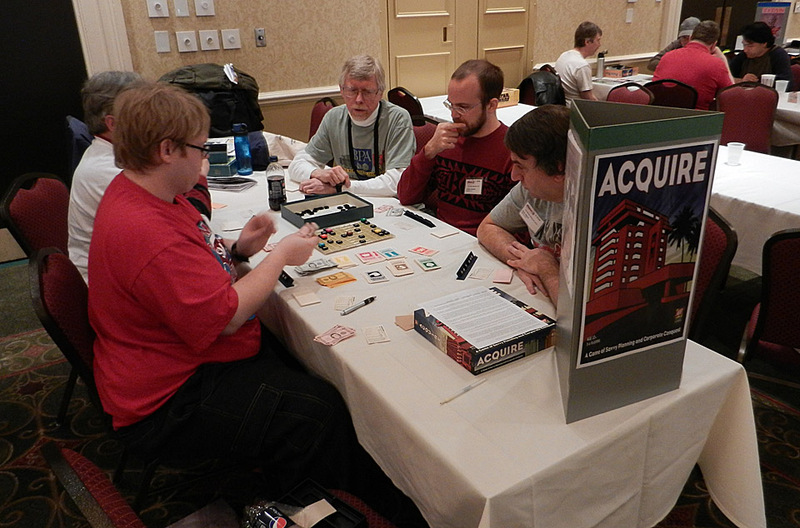 Today, I’d like to share a few pictures from this past weekend’s venture to Charlottesville, Virginia to Prezcon, an annual gaming convention that features board and card game tournaments, much like at the World Boardgaming Championships in Lancaster in August. 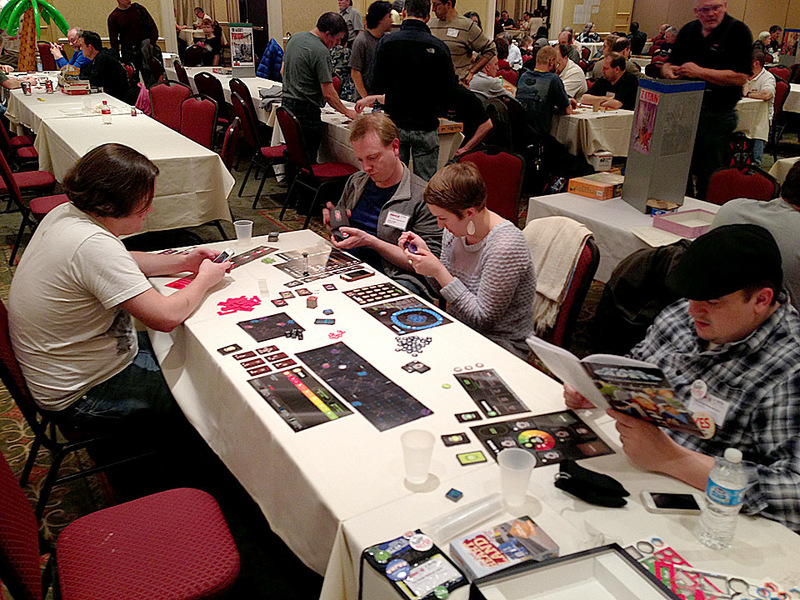 Prezcon is a little bit smaller than the WBC, but has the same relaxed and welcoming atmosphere, so it was the perfect place to kick back and unwind after the long – but wonderful – Compounded Kickstarter campaign. Enjoy the pics and mini-reviews, and happy gaming! The main gaming hall is always full of interesting games and gamers, new and old. 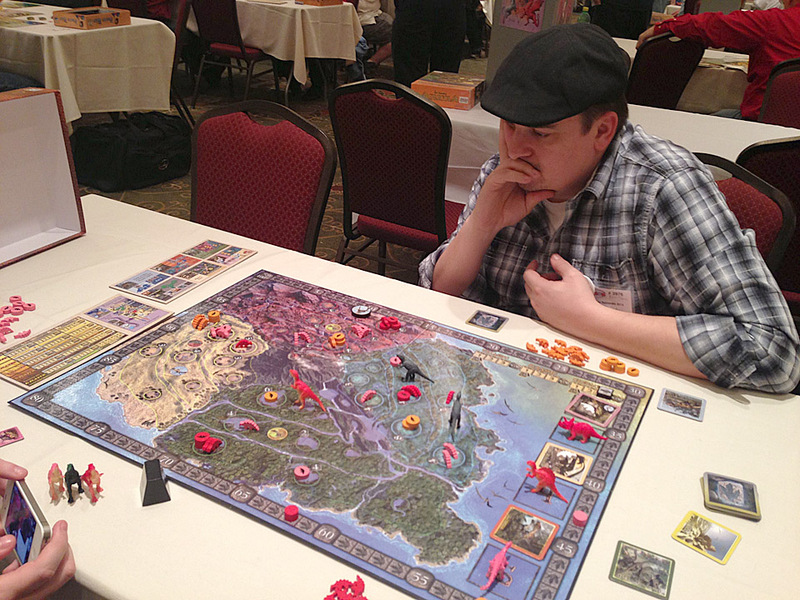 Sanctioned scheduled or tournament games are easy to locate by the large table markers, like that for Carcassonne in the foreground. One of the biggest tournaments was the one for Puerto Rico. There was a lot of head scratching and stern faces for a few hours. 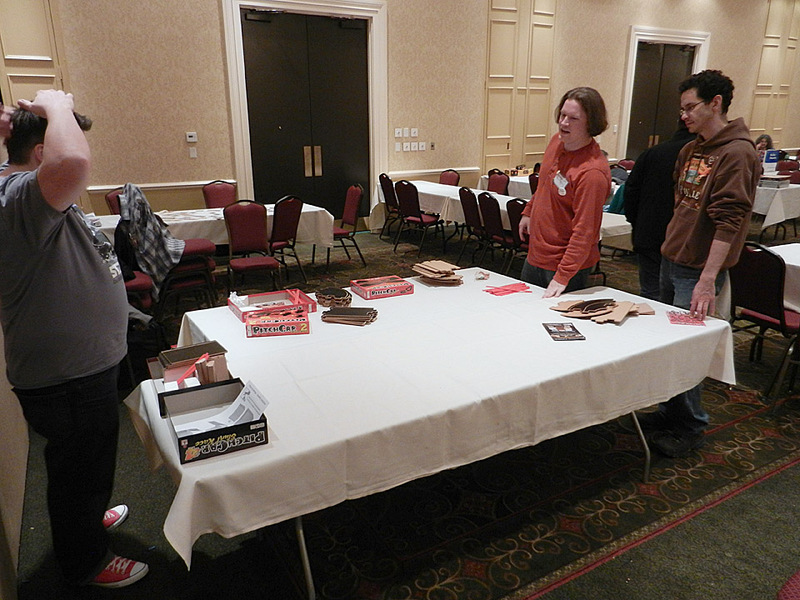 One of the great things about Prezcon, as well as the WBC, is that it’s a great atmosphere for gamers of all ages, and lots of families show up to compete and have fun. 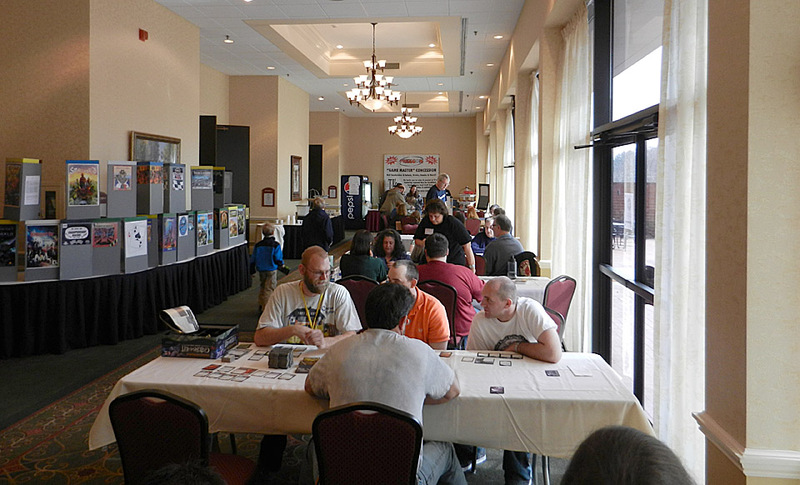 This is the hall just outside of the main gaming area, and typically where we hang out, sewing mischief and mayhem. 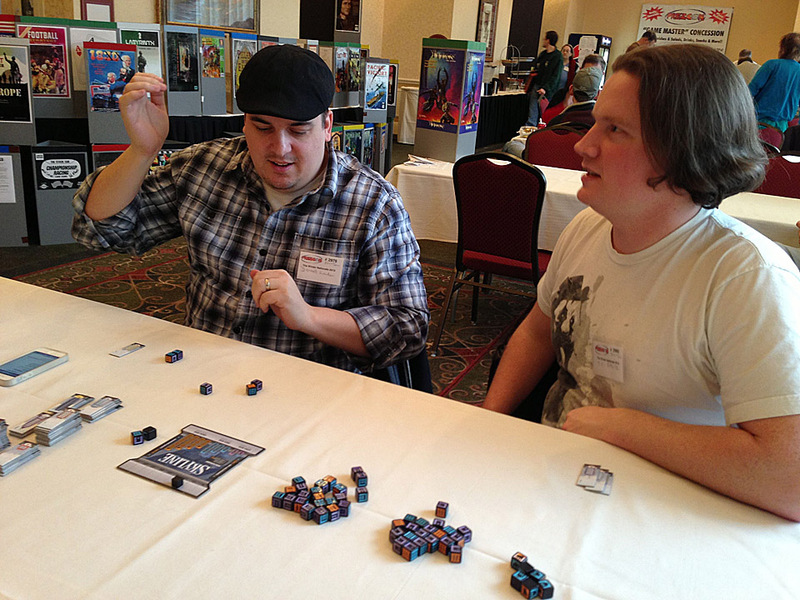 And here’s Mischief and Mayhem – otherwise known as Darrell Louder and TC Petty III – playing our first game of the con, Skyline. 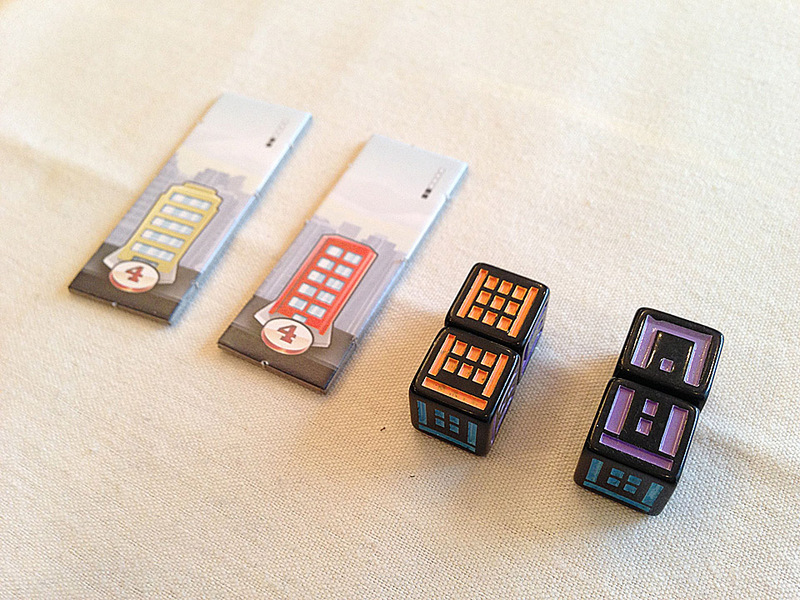 Skyline was a dice game given free to all backers of Ground Floor by Tasty Minstrel Games. I had been wanting to get it to the table for awhile, and it was a good, light start to the weekend. The game itself doesn’t rock my world, but the components are excellent, and it would be a great game for families and gateway gamers. Another game I had been wanting to get to the table since the Kickstarter campaign was Glory to Rome. 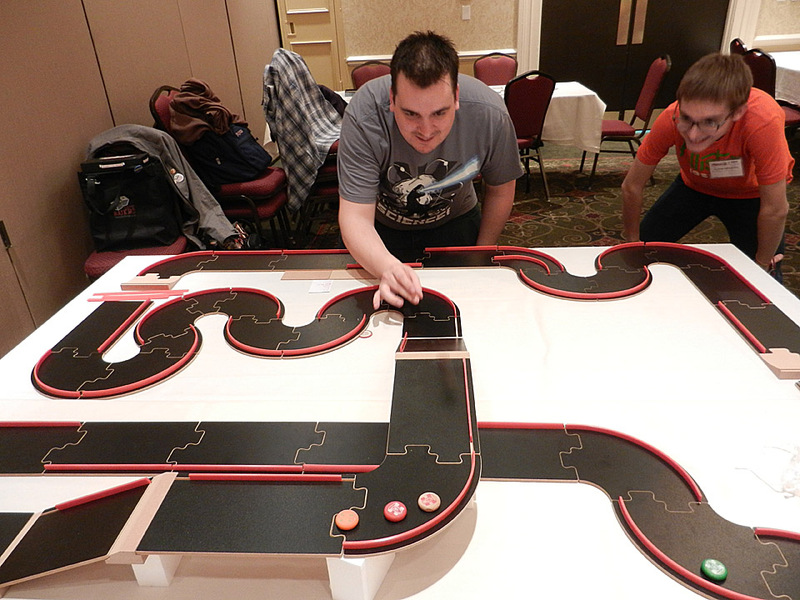 TC brought along his Black Box edition so we made this our second game of the con. The game is gorgeous, and the wait was worth it – I absolutely loved it. I enjoy card games where the cards have multiple uses as it forces you to make tough and interesting decisions from start to finish. The lead/follow mechanic present in Puerto Rico/San Juan is here, as well, which means that there is really no downtime when it’s not your turn. 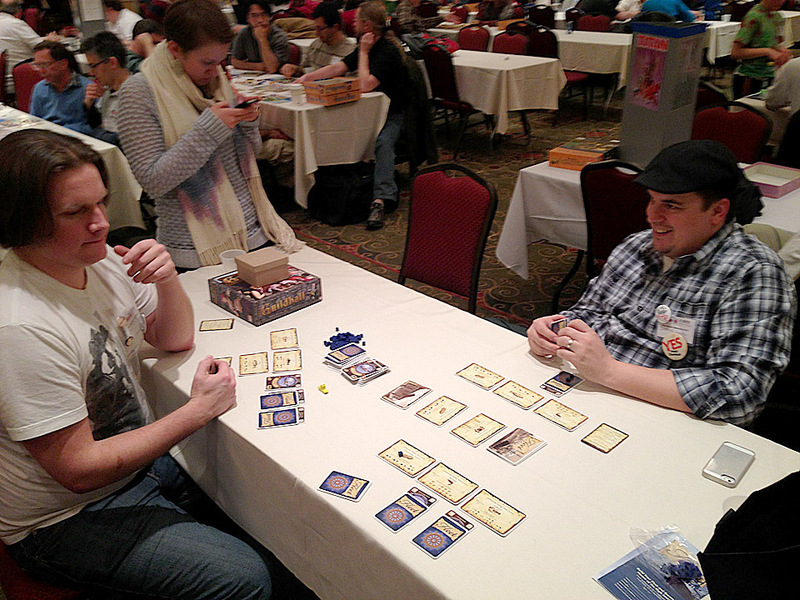 We enjoyed Glory to Rome so much that we played it on the second day, as well. 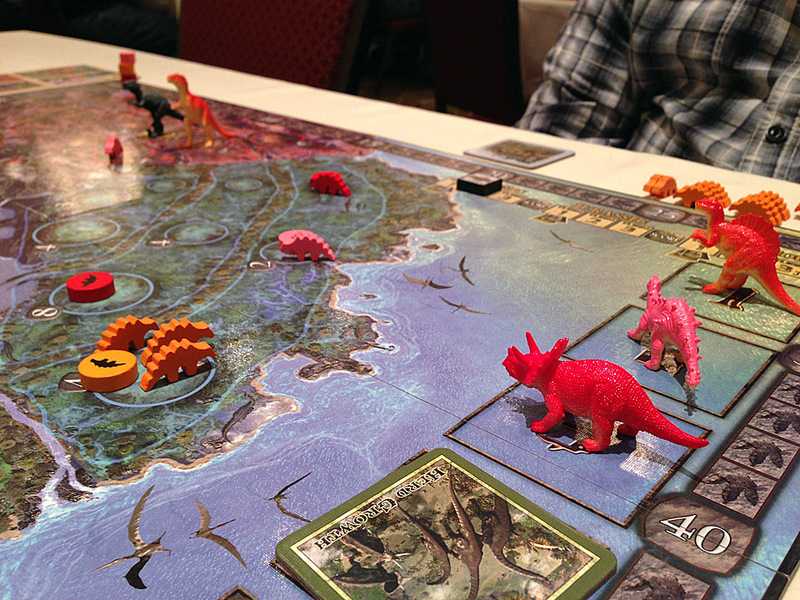 We took a break and shifted our venue to the main gaming hall for some hot dinosaur action in Triassic Terror. 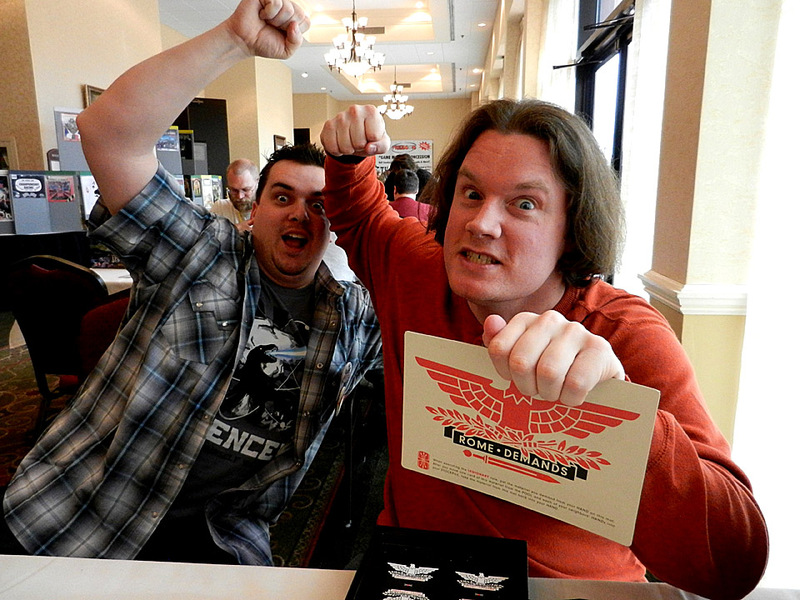 Eagle & Gryphon sent me an advance copy to try out, and I’m really glad we were able to get it to the table at the con. In the game, players grow their herds of dinosaurs and migrate to other environments, hoping to be the dominant species. Players can also take actions that allow them to control predators like the T-Rex, Velociraptors and Pteradactyl. It’s primarily area control and role selection, and it was pretty fun and balanced. In our game, TC trailed for most of the game, but was able to come back strong in the final round for an exciting, last-minute win. 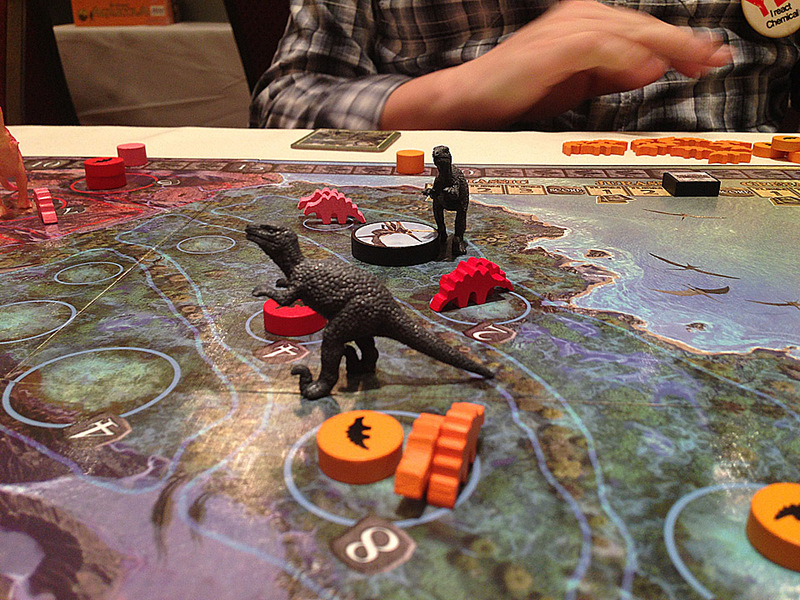 Triassic Terror is on Kickstarter right now – check it out! No con would be complete without Fleet. Have you played Fleet yet? It’s so good. Clyde Wright and Emily Pace joined us later in the evening and we knew we wanted to play something lively and social. So, we broke out Space Cadets, thinking it would be easy to get into. Wow, were we wrong. This “family game” has a 30+ page rulebook with different rules for each station on the ship. The stations are constructed like mini games – for instance, I was at the Helm, guiding the ship around with programmed movements like Robo Rally, while TC took on the weaponry, which played like a dexterity game. Overall, it took us well over an hour to get started, and even then we’re pretty sure we played just about everything wrong. But we had a good time, and that’s the important thing. I look forward to playing this again soon, but this time I’m going to make sure we all know how to play before it hits the table. 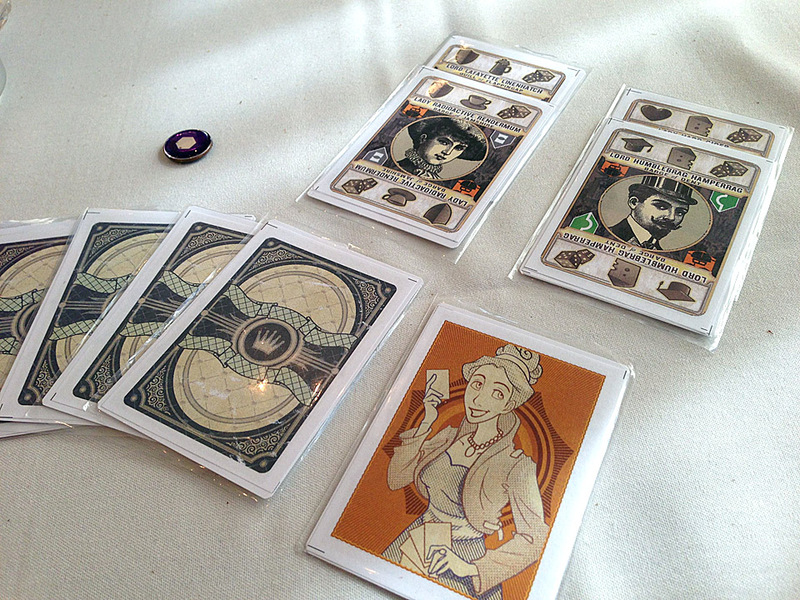 On the second day, designer Benjamin Rossett showed up with a revised prototype of his new game, Brewmasters. 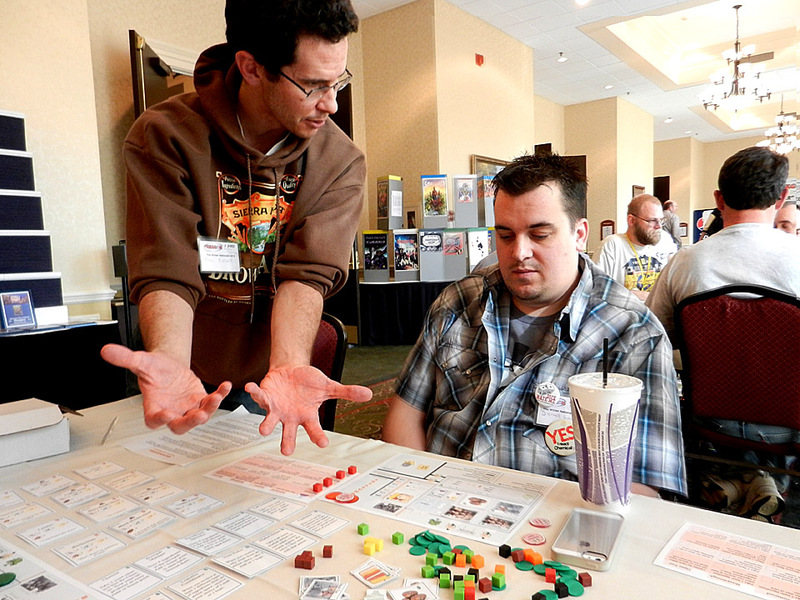 I had a chance to play Brewmasters at Unpub in January, and I really enjoyed it. Ben had been working hard with more playtests and revisions since then, so we all sat down for a four-player game to see how it had improved. The answer? A lot. 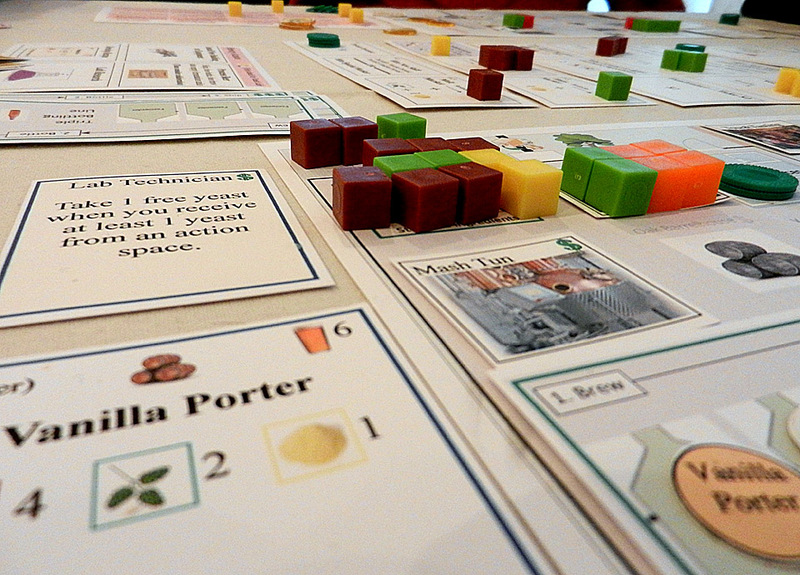 The game was full of big, meaningful decisions, and there were even more choices in how to upgrade your brewery and crank out those specialty brews. TC ended up crushing us at the end of year three, and we surmised that it was because his fruit/hops farm was a tad overpowered. We spent quite a bit of time talking about tweaks, ways to increase variety within the game, allowing more players access to special recipes and just generally how to make Brewmasters an even more awesome experience. 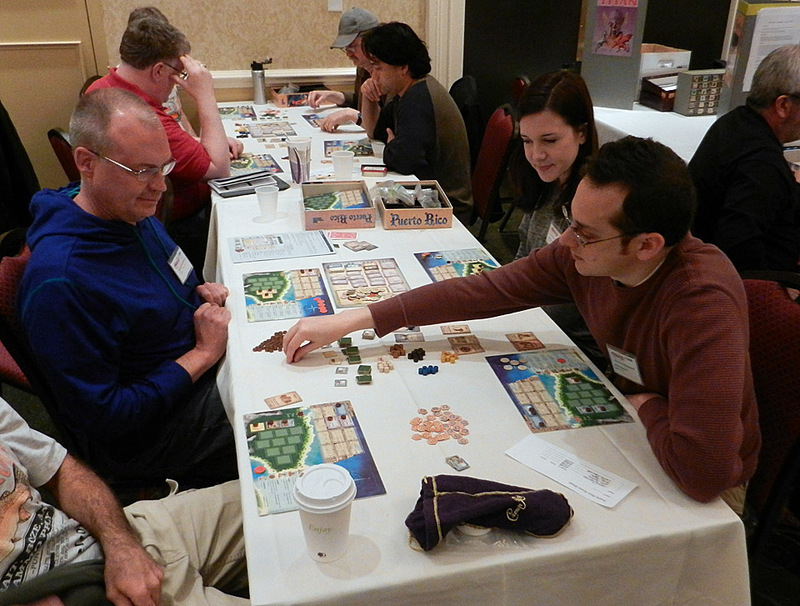 Playtesting and giving feedback is sometimes a lot of hard work, but it’s also a fun and rewarding part of this great hobby. 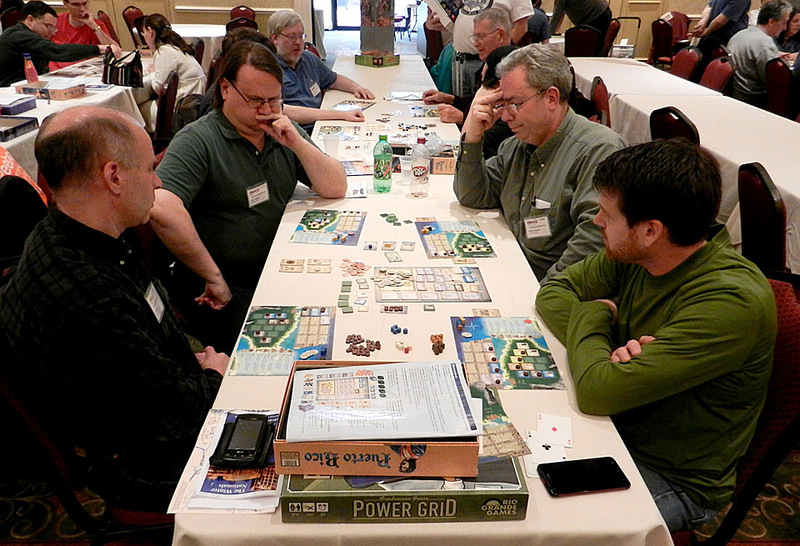 A portrait of modern boardgaming. 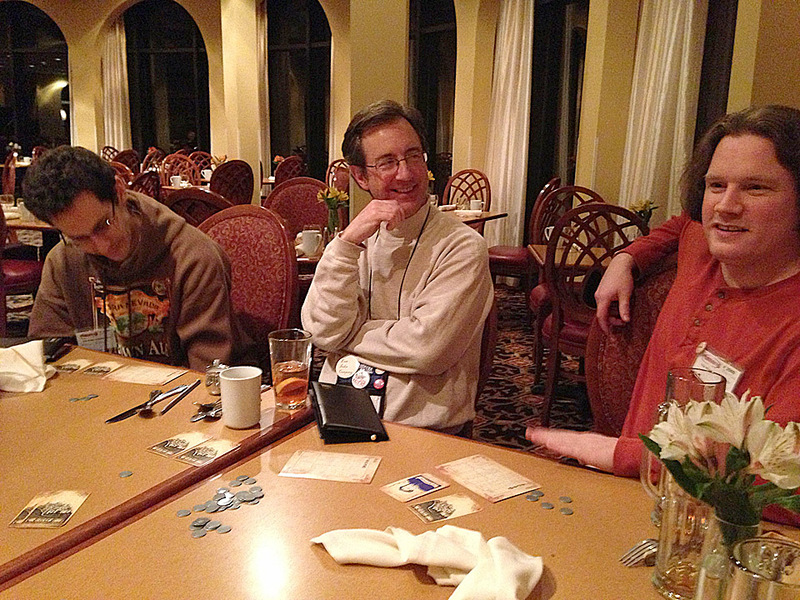 Paul Owen – designer of East India Company and an all-around great guy – joined us all for dinner where we broke out Coup. 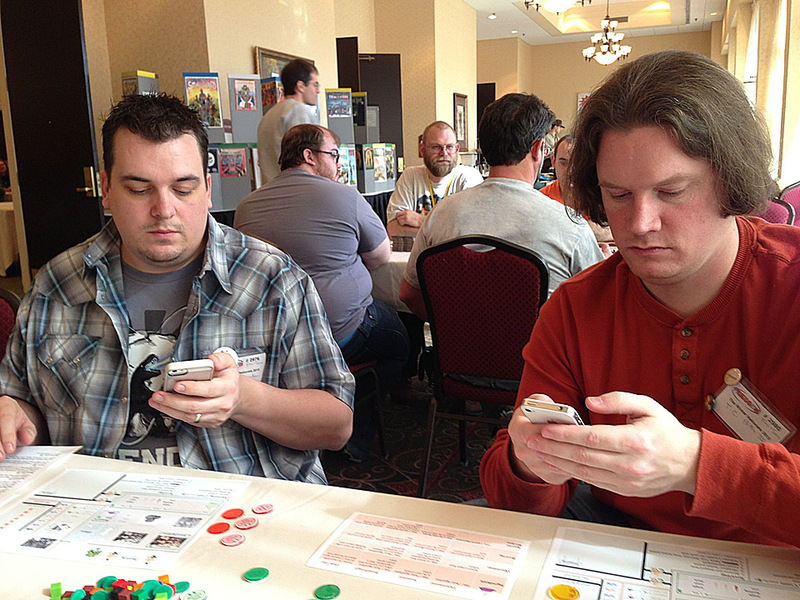 Neither Paul nor Ben profess to be social gamers, so they were a little out of their element in this down-and-dirty cutthroat affair. However, they held their own and Ben even pulled out a surprise win in the second game. 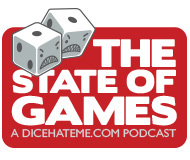 I mentioned Coup when I first played it at Unpub in January, and you can hear more about it on Episode 40 of The State of Games and the upcoming Episode 42 that drops this week. It’s worth checking out because this game is awesome. Easily one of my favorite new games of 2013 and quickly supplanting The Resistance as the go-to social experience for 6 or fewer players. Ah, Pitchcar. Words cannot describe my joy and love for this game. Darrell and TC both brought sets, so we combined them to create a massive track on Saturday night, which drew a huge crowd of onlookers. 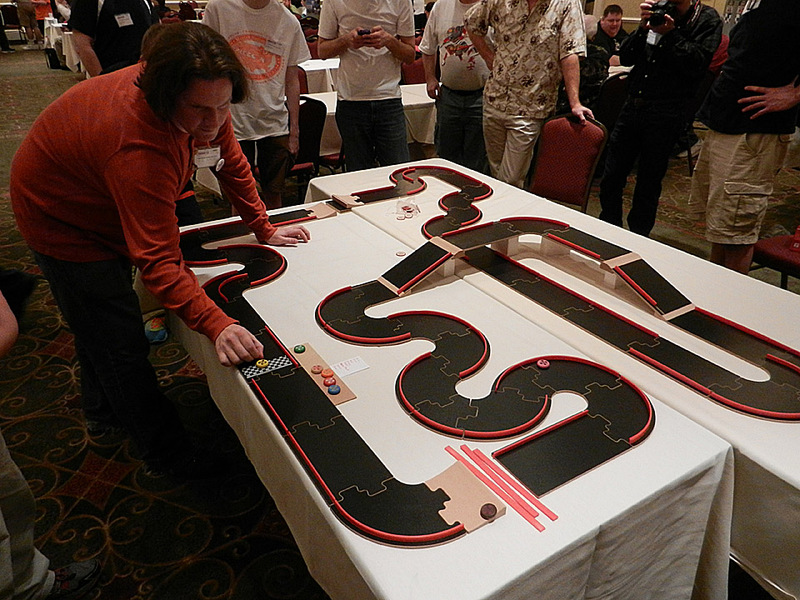 The insane track created some interesting bottlenecks, and the stragglers ended up being lapped by the last lap. 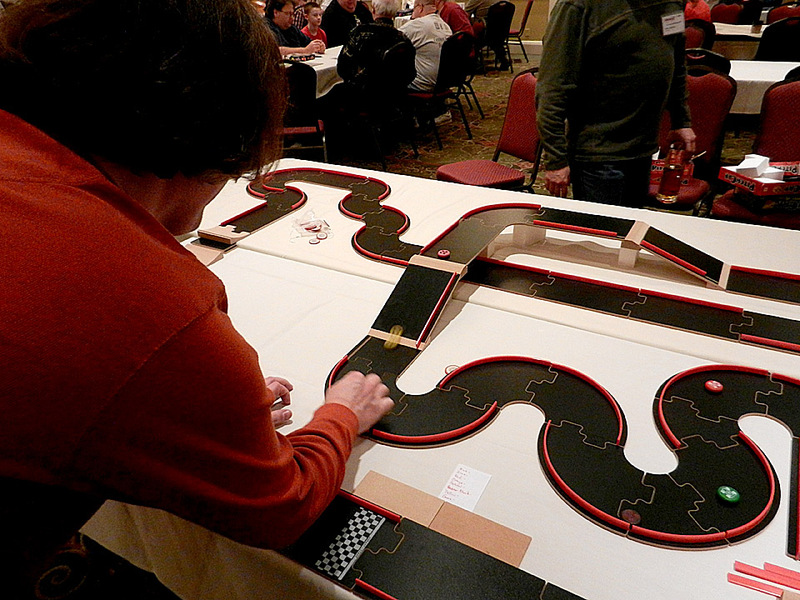 But, all eight players had an amazing time, and we’re pretty sure massive Pitchcar is going to be an annual Prezcon tradition. 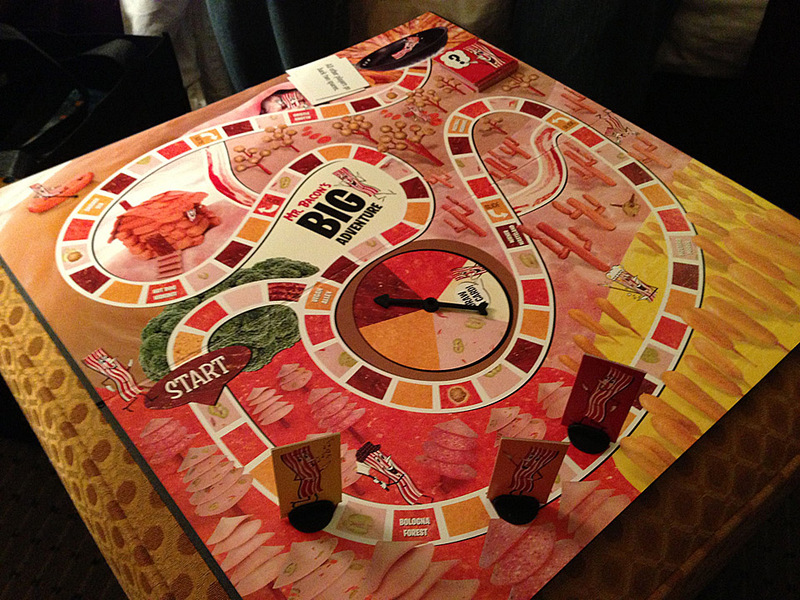 Nothing says late-night fun like bacon and a spinner. 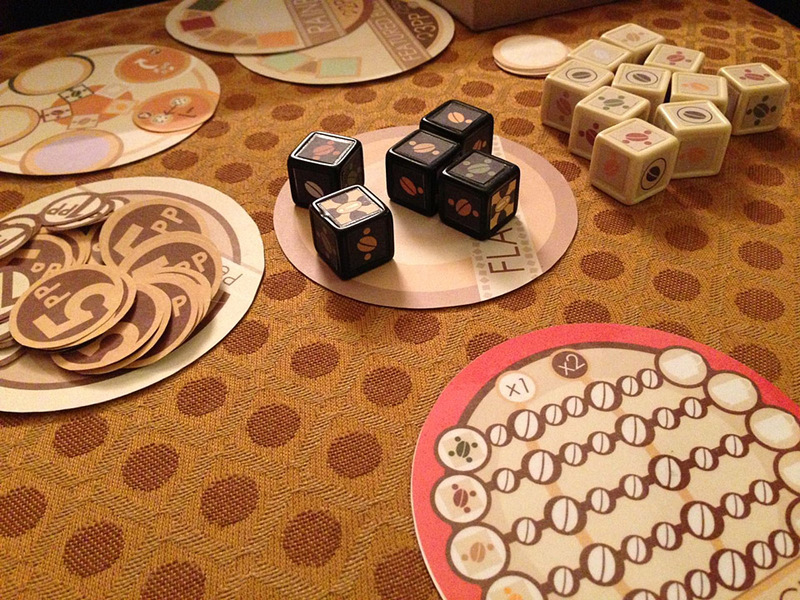 And speaking of late-night fun, we wound down the evening in the wee hours by playing back-to-back games of TC’s latest build of VivaJava Dice. 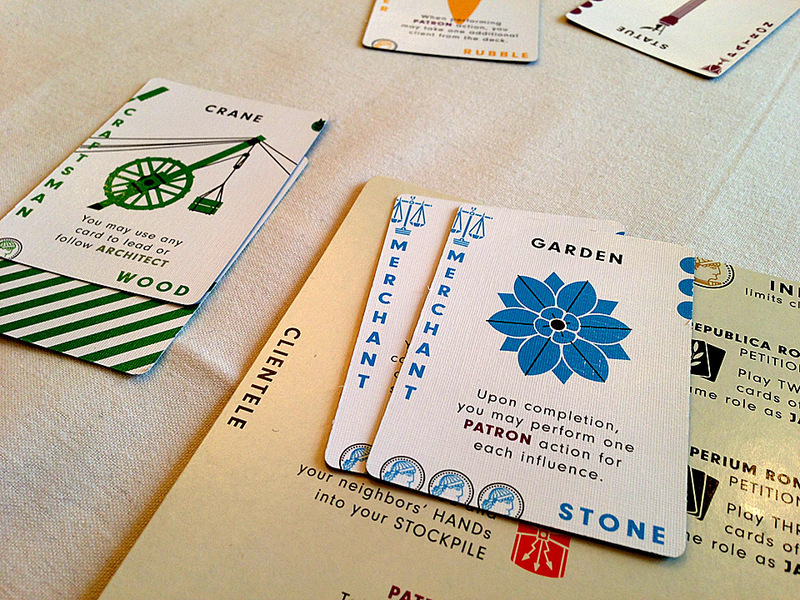 The game is coming along wonderfully, and the prototype is a work of art in itself. 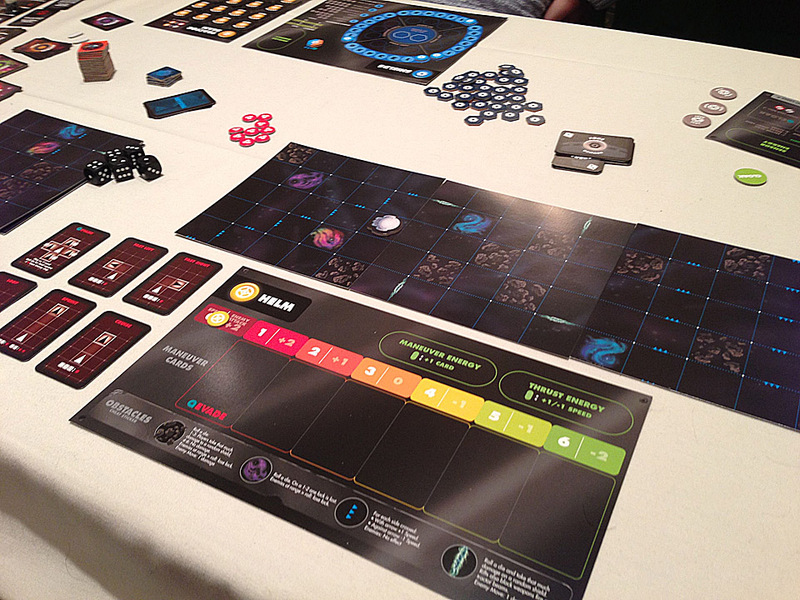 The gameplay is pretty unique, especially for a dice game, and there is so much variety and expandability built into the system. Both games played smoothly and tight, but we all agreed that even though the core essence of VivaJava was there, a little bit of the social element needs to be injected. We brainstormed some solutions and TC has ran with a couple of ideas that I believe are going to make this already special game truly a unique and wonderful experience. I love development! Sunday was spent winding down the weekend with another play of Brewmasters and a relaxing game of Daniel Solis’s Belle of the Ball. Belle is really coming along great – it’s easy and quick to play, and I really think that it’s going to appeal to a wide range of gamers. A variety of advanced variants to bring more strategy for less casual gamers are in the works, so Belle is really blossoming into a beauty. And that about does it for Prezcon 2013. 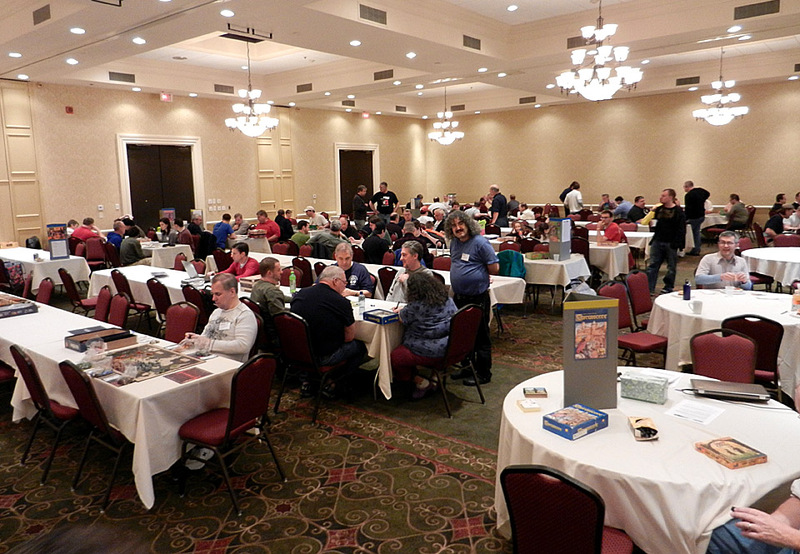 If you’ve never attended this convention, I would highly recommend it – a great venue full of great people and great games. 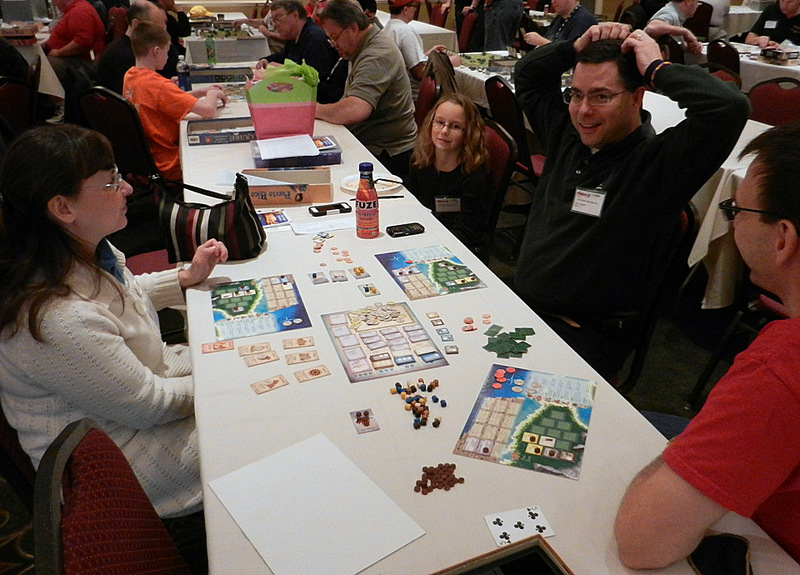 Happy gaming, and see you all at Prezcon 2014! Good stuff Chris, thanks for posting. 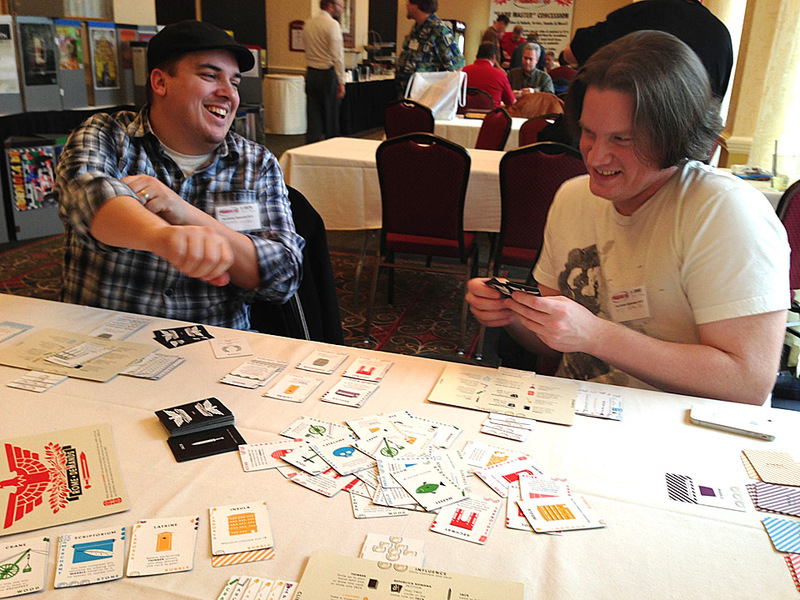 Excited to see VJ:TCG:TDG and BrewMasters at some point this year – maybe I’ll get a chance to playtest them at GenCon!? Mr. Bacon’s Big Adventure? That’s absolutely glorious!